From "guest writer", Richard Mendell. 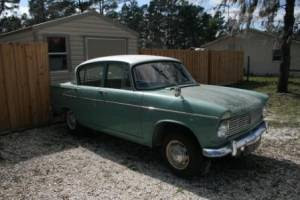 This Hillman is a complete but tired example in that great automotive bazaar known as Florida. Not a lot about it on the craigslist ad, but it appears to be a complete and running example. For those of you not familiar with this classic British marque, it was part of the (in)famous Rootes Group, also home to brands Humber and Sunbeam. This Super Minx was one of the last of the "all Rootes" vehicles though, as Chrysler would take over the company by the end of the decade. This example clearly needs some attention. The exterior looks to be complete and straight, but whether the paint will clean up or not is an unknown. 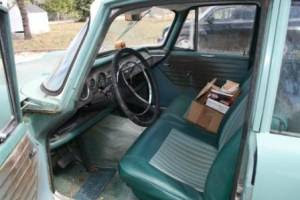 The interior is similarly complete, although it appears to be filthy (look around the window cranks...egads!!!). The seller promises: Runs and interior in good condition. All parts for engine, brakes and other accessories included. All new parts in box. Hard to tell if that's a good thing or not, but if you want to be the only kid in town with a toy like this, here's your chance. Thanks for the post, Richard! now THAT is cool!! Wish it was here on the West Coast, I just Sold my 60 Edsel and I'm looking for something that's not 17 feet long to replace it with. This would be perfect!! Easy now, rrshadow. You've owned everything at least twice now, so leave some for the rest of us! I am such a fan of your blog, but every time I see another tired old Brit car of the 50s and 60s featured here so lovingly, so unquestioningly, I have a bit of a laugh/cry at your touching naivitie. Have you driven these dismal things? They should belong to their own category of 'Decline and Fall' you know. Many of them made it out here to Australia, and most were find quite thorougly wanting, even in our suburbs, let alone the tough going out in the bush. Exceptions: Vanguards (tough); Wolseleys (tough)... and that's about it. OK, the Hillman Hunter wasn't too bad, but there was just so much third-rate Brit rubbish around then, and I am afraid your excellent, entertaining, wonderful blog celebrates far too much of it. There: I've had my spray. Back to lurking!